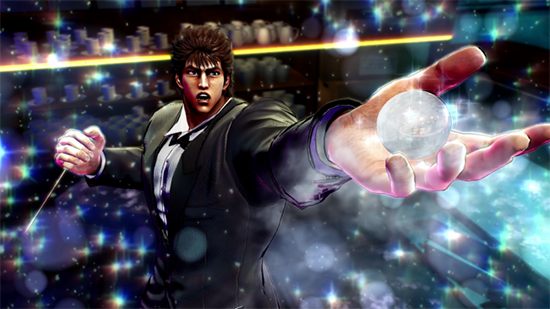 Presented by Ryu ga Gotoku Studio, the development team behind the beloved Yakuza series, Fist of the North Star: Lost Paradise is now available in North America and Europe on PlayStation 4, giving fans the chance to experience more of Kenshiro's life as part of an alternate universe of the original series canon. Run, punch, and literally force the life force energy from your fists into the bodies of over-muscled thugs. Their bodies will explode. It's pretty crazy. You can set the blood to mild if it's too much, but we won't because it's launch day and nothing says celebration like a rain of comical chaos. Also, there's a pretty deep story in the game. You'll explore the post-apocalyptic city of Eden, an oasis in a perilous desert filled with danger that just so happens to be your starting point for finding the lost love of your life, Yuria. Their love is one for the ages. It's a pretty serious story. If you want to take a break from the drama of love, you can also run your own bar and serve up wasteland cocktails. Or run a health clinic. Or play some Outrun, one of the classic SEGA games included in the actual game. Anyway, there's a lot to do besides punch your fists, but we suspect you'll enjoy that part a lot. Here's all of the other info and hot tip: during the first two weeks of launch, you can get a free Kiryu skin add-on that lets you play as the Dragon of Kamurocho. It's wacky and we love it. 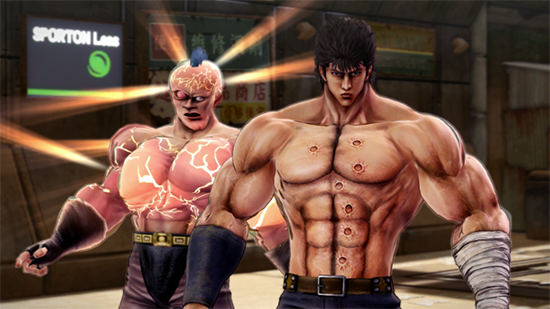 Extra Carnage - Fist of the North Star: Lost Paradise features everything available in the original Japanese release, Hokuto Ga Gotoku, plus enhanced carnage for the localized version! For the first time, witness the full effects of Kenshiro's brutal "Hokuto Shinken" on the lowlifes and thugs of the post-apocalyptic wastes. You can turn extra blood on or off, depending on your playstyle!